This little journey begins in mid summer of 2010 when I changed my screensaver on my computer to a beautiful picture that caught my eye last year on the net of a creek called Paulina Creek here in Oregon. 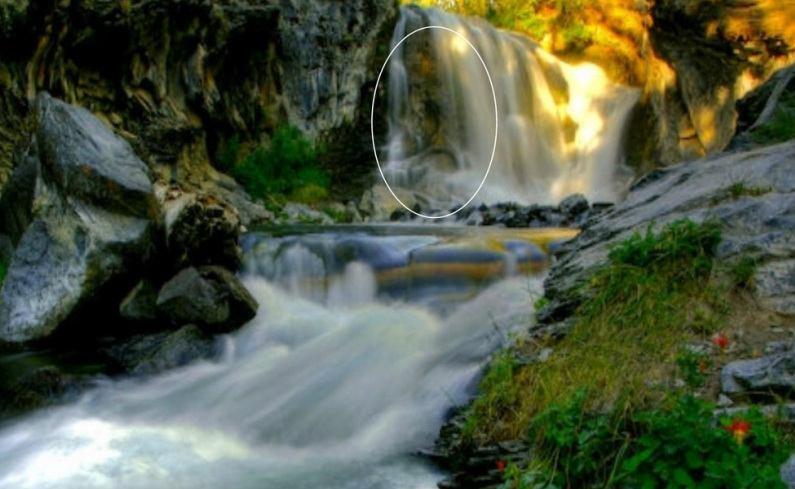 Later that afternoon I walked into my room and came to a startling halt staring at the photo on my screen.....What in the world do I see behind the waterfall but another face! I shook my head, started laughing and thought there is no way!! So I called my sons into the room once again and simply asked if they saw anything in the photo....thinking I've just been seeing way too many faces and lost my mind okay!! My 13 yr old came in exclaiming, "Wow is that some weird face behind the falls........is that a lions face? "......I couldn't believe it! Well, either the apple doesn't fall too far from the tree and we are both completely delusional or it might have some validity. The image was taken by a photographer in what looks like early spring at Paulina Falls......75-100 miles from Paisley Cave and the possible ancient site. So I packed a little picnic for myself, grabbed my camera and off I went. Please see following pages.